It’s that time of year again. Summer is winding down, the nights are cooling off and fall is on the horizon. If you have kids, you know exactly what the groans are all about: The first day of school is around the corner. While they may not be particularly thrilled with the inevitable return, the least you can do is get both them and your home organized for a smooth transition. The following pics will give you some direction on what you may need: desks, storage ideas and organization tips for starters. You may still have to drag them out of bed when that first day arrives, but at least you’ll be content that your home is ready to face the school year. Load your kids' rooms with shelving; they’re going to need it to help them stay organized. Plus, starting them with basic organization tools will help them kick off the year on the right foot. This design is a great space saver as it includes both shelving and a desk. Don’t feel like you need to find a desk-and-shelving combo. The freestanding Expedit bookcase from IKEA is affordable, classic and a good way to get organized. 2. What about a desk? A desk in a study area will help your child do her homework comfortably. Try to find one with drawers or shelves so she can keep her supplies and knickknacks in order. If the desk doesn’t come with drawers or shelves, add other elements to help keep things in place. 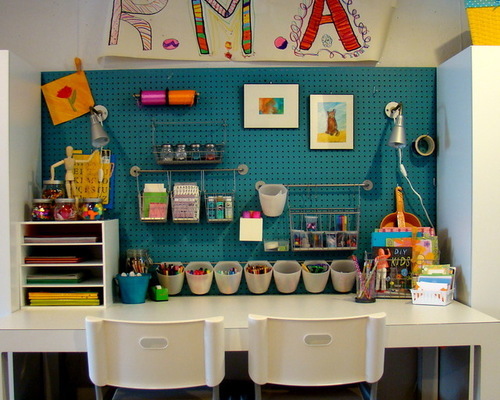 The addition of this pegboard creates flexible vertical storage space with room for decorations to keep it fun. A small freestanding shelving unit will keep papers and homework in the right spot. Don’t feel like you need to go out and buy a bunch of fancy organizational tools; look around the house first! Coffee mugs and small kitchen bowls are nice alternatives for keeping utensils and desk supplies corralled. If your child feels trapped away in his room studying all night, invite him into the kitchen by adding a workstation there. This keeps him part of the activity while you prepare dinner, and you can be sure he gets all his homework done. If you already have a workspace of your own, consider adding another table for the kids. That way everyone can get individual tasks done and still be together. The start of the school year also means after-school activities, which tend to include a lot of stuff. Keep sports gear, instruments, coats, boots and more organized by installing cubbies. Build them with different compartments for large and small items, and don’t forget hooks for jackets. Don’t have room for an entire cubby system? Hang a freestanding coat rack so at least your jackets and scarves will have a home upon entry. Now that you’ve got all the activity stuff organized, it’s time to figure out how you’re going to keep track of everyone’s schedules. The Daily System from Pottery Barn includes a variety of items, including calendars, bulletin boards and storage racks you can mix and match to your needs. Chalkboards are also an easy way to keep things in check. 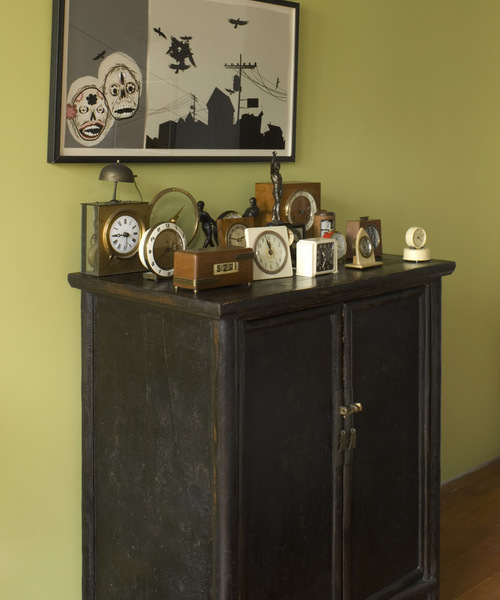 Either hang a freestanding chalkboard or cover a cupboard with chalkboard paint. 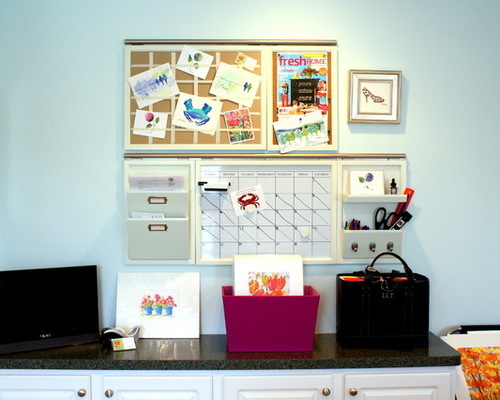 If you have space for it, a built-in organizational unit will help you keep track of school directories, schedules and all the other paper items that your kids come home with. And boy, is there a lot!